Home » Blogs » Charles Gaba's blog » UPDATE: NY Times shows same level of professionalism as the Detroit News. That's not a compliment. Huh. Well, that's kind of important as well, yes? This is just the start of the mess, however. Over at Newsweek, Kurt Eichenwald has done an amazing job of systematically tearing apart the rest of the NY Times story, piece by piece. It's pretty jaw-dropping. So had the Times mixed up a criminal referral—a major news event—with a notification to the department responsible for overseeing FOIA errors that might affect some documents’ release? It’s impossible to tell, because theTimes story—complete with its lack of identification of any possible criminal activity—continues to mention a criminal referral. As you may recall, after I wrote about this pack of lies on this site, I also submitted my own Op-Ed rebuttal to the Detroit News, but never heard back from them about it. Then, a few days later, it turned out that the News went back in and made (partial) corrections to (some) of the more glaring errors...without including any sort of correction notice (not to mention scrubbing all of the comments from the original version). Then, after further criticism by myself and others, the News finally posted a correction notice...which itself was still misleading (and without correcting some of the factual errors which had been pointed out earlier). Now, there are, of course, many differences between the two situations. 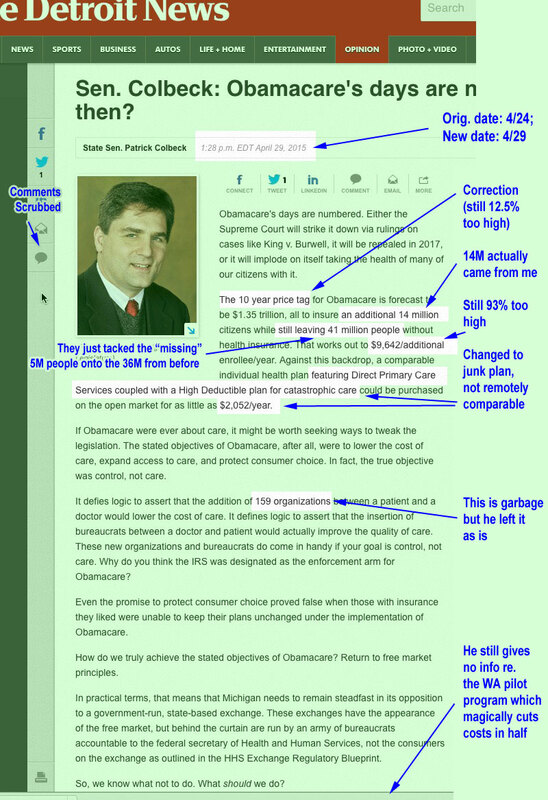 The Detroit News let Sen. Colbeck's BS Op-Ed sit for 10 days before making any corrections, while the NY Times made at least a partial correction within an hour or so of the story being published. the New York Times receives several magnitudes more traffic and attention than the Detroit News. 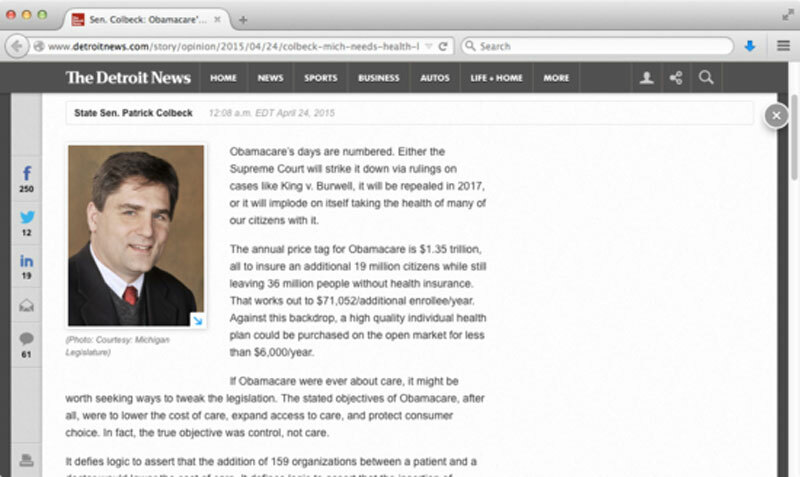 the subject of the News piece was about how much the ACA might impact the federal budget. The subject of the Times piece was whether or not a former First Lady, former U.S. Senator, former U.S. Secretary of State and current frontrunner for the Democratic Party nomination for President of the United States is the subject of a criminal investigation. the headline in the News piece wasn't particularly inflammatory and didn't really need to be corrected, whereas the Times headline is extremely inflammatory...and is still there. I'm obviously not trying to compare myself to a real journalist like Eichenwald. At the same time, I've spent the past nearly two years doing my best to provide accurate, real-time enrollment and related data for the Affordable Care Act, debunking mountains of bullsh*t along the way. Usually I do a pretty good job, sometimes I mess up. But I'm an unpaid blogger. This is the New York Friggin' Times. Depressing.